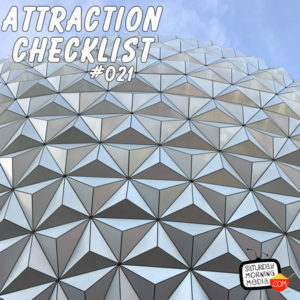 http://www.attractionchecklist.com – It’s time to take a ride on EPCOT’s signature attraction, the grand and miraculous, Spaceship Earth. John B. deHaas joins us for the ride! Ride Audio Recorded on May 28, 2015. Today we take a ride on one of the most instantly recognizable Disney Park attractions anywhere, EPCOT’S Spaceship Earth. On this attraction you will, as the guide map states, Explore the history of innovations from the stone age to the Digital Age. This attraction is open to guests of any age and there are no height requirements. The Thrill Level for this attraction describes it as being Dark and a Slow Ride. Fastpass+ is available for this attraction. Before we thank the Phoenicians, here are five fast facts about Spaceship Earth. 1. The 15 minute long dark ride that is Spaceship Earth is an EPCOT opening day attraction, beginning operation on October 1, 1982. 2. The geodesic sphere which houses Spaceship Earth is a whopping 18 stories high. The sphere took 26 months to build and was designed with the help of science fiction writer Ray Bradbury who also helped write the attraction’s original narration. 3. Since opening in 1982, the attraction has had four narrators. Actor Lawrence Dobkin, news anchor Walter Cronkite, Actor Jeremy Irons and, currently, actress Dame Judi Dench. 4. A 63 piece orchestra and 24 voice choir conducted by Emmy winner Bruce Broughton provide the soundtrack for Spaceship Earth. Each scene of the attraction features music styles and instruments appropriate to the era and each piece transitions seamlessly into the next. 5. One of the most memorable moments of the attraction is the top when your car spins to reveal planet earth among the stars. In the early days of the attraction, this spin was done by hand by a cast member who stood at the top of the dome and spun the cars manually. These days the spin is done automatically within the ride system. And now, let’s ride Spaceship Earth. John B. deHaas is along for the ride today and afterwards we will discuss our thoughts on this attraction. This is a binaural recording so if you have headphones, put them on now as we experience, EPOCT’S Spaceship Earth. ← Best Puppet Vines 2015 Uncle Interloper with Tooba of Goon Holler, Squeaks The Mouse and Santa Claus!